The World Bank reports that, on a purchasing power parity (PPP) basis, China’s economy is set to become bigger than the US’s while India has overtaken Japan. China has declined the honour of being soon the world’s largest economy. The economic rise of China to becoming (at some stage) the world’s biggest economy is the return of the normal pattern of world history. At least since the First Emperor (r.210-220BC), whenever China was unified, it was the world’s largest single economy (with the possible exception of the Roman Empire at its height). Indeed, China was historically more economically “dominant” than it has any prospect of becoming in likely futures. According to the Maddison estimates, in 1820, over a third of the world’s population was in the Qing Empire, producing about a third of world GDP. 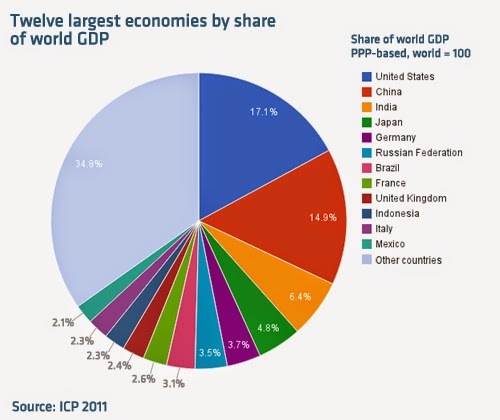 This is the sort of economic “dominance” that is never likely to come China’s way again. The US did not automatically replace Britain as the manager of the international state order simply because its economy became bigger. The Pax Britannica did not immediately become the Pax Americana. Partly, this was because adding in the British Empire shifts the economic balance. Mainly, however, because the US made little or no effort to become global hegemon or state-system manager. The US Navy, for example, remained considerably smaller than the Royal Navy until the Dynasts’s War (1914-1919) and the Washington Naval Treaty (1922). The biggest failing of US policy was remaking the world monetary order by creating the US Federal Reserve (by concentrating the US gold reserves, suddenly the new US central bank had about 27% [pdf] of all world gold reserves: 45% by 1923) and remaking the world state order by its intervention in the Dynasts’ War and the Treaty of Versailles and then stepping back from the responsibility that came with its actions and power. The result was 1929-1945: the Great Depression, the rise of Nazism and the Dictators’s War (1939-1945). Not that it is a prospect any time soon, but a regime which gave us the Beijing Massacre, the Great Firewall of China, has had border wars with its neighbours, ruling a state-culture whose history was of conceiving other states as either tributaries or enemies and whose name for itself translates as “centre of the universe” [literally it means “central country” but culturally it is more like “centre of the universe”] is not a preferable prospect as global (or even regional) hegemon. As, indeed, almost all the other states in its region agree. This entry was written by Lorenzo, posted on at 7:40 am, filed under Britain, Defence, Economics, Events, History, Public Policy, Taxation, Technology. Bookmark the permalink. Follow any comments here with the RSS feed for this post. Post a comment or leave a trackback: Trackback URL. It is also notable that great economic or even military power does not translate to real international hegemony if you are surrounded by too many too powerful neighbours… Ask the Romans, the Ancient Chinese, Napoleon, the Chinese Empire, the Kaiser, the Chinese Republic of The 1920’s, Hitler, Stalin and his successors, or the Communist China of the modern world. 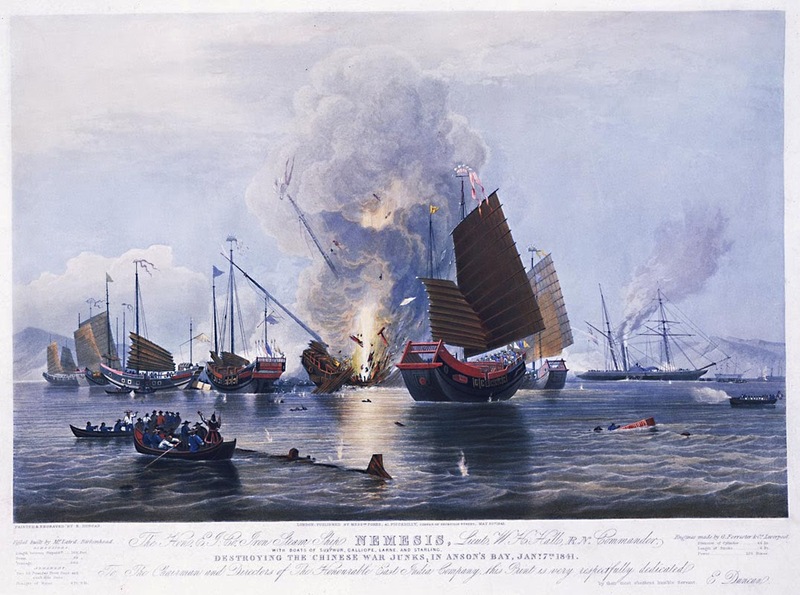 Modern China is actually somewhat less likely to make a success of naval power projection now than it did several centuries ago (when it’s great exploring and trade fleets had precisely no significant effects on world history). South America, Africa, the Middle East, Asia, all had their guts torn out by the US dominance. The current mess is a result of the US dominance. Tell me again, who benefited? Apart from a few little areas and for resources, I very much doubt China actually wants to engage in the world the way the Americans do, as there are simply still too many problems in China to worry about. I think this obvious to anyone that’s actually set foot in China (fortunately, these days, including many people in the government). I also agree these numbers are fairly meaningless given most of the country are still peasant farmers and there are still huge levels of corruption stifling most new scientific (and other) development. Lorenzo, your link to Moneyillusion is worth it just for the link dropped by one of the commenters to the Super Karate Monkey Death Car 🙂 That aside, I agree with conrad above, if his view is relatively short term – say 50 years. [email protected] Managing the world trade system through naval power is, indeed, another way to look at it. [email protected] The suggestion that the problems of those areas are the fault of the US is Westocentrism at its worst. And better than another 1939-45 is surely obviously true: if nothing else, the world trade system has been managed well enough that more people have moved out of poverty in the last 30 years than all of previous human history combined. In general agreement with you on this one, Lorenzo, altho I’m a bee’s knee less supportive of American military adventurism than yourself. For instance, I’m not sure that the Iraq War was the best way to spend the two trillion dollars George Bush found in the White House cookie jar. As for Peter Hindrup’s comment, I’ve coined the term American preternaturalism to describe those unfortunate lefties who subscribe to the wacky belief that America is responsible for all the ills of the world right up to and including the weeds that grow in your average suburban lawn. [email protected] Well, yes: there’s lots of room for disagreement about the specifics of US policy.